Protect your WordPress site from spam registration. 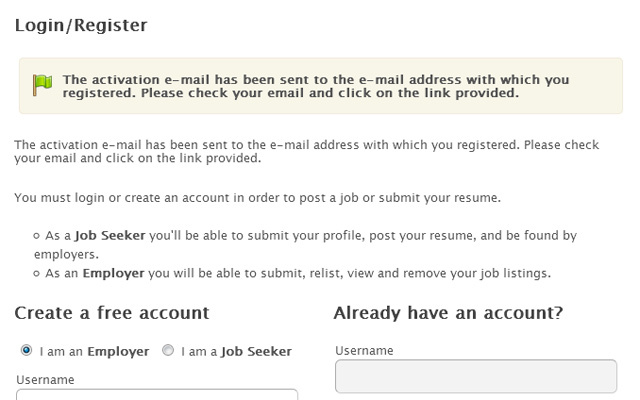 Confirm Email requires new users to confirm their email addresses. 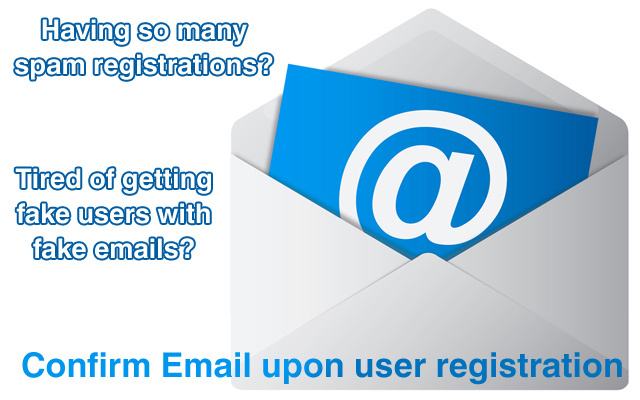 Having so many spam registrations? Tired of getting fake users with fake emails? Good news! Confirm Email will solve your problems. Confirm Email will send a confirmation email and the only time it will actually “create” the account for the user if the email address is confirmed. Confirm Email integrates seamlessly with AppThemes registration system and uses all native registration hooks which allows all your current customization and plugins to the registration work. Sends confirmation email upon registration. Requires from users to confirm email address before they can login on site. Disallows users with not confirmed email from resetting password. 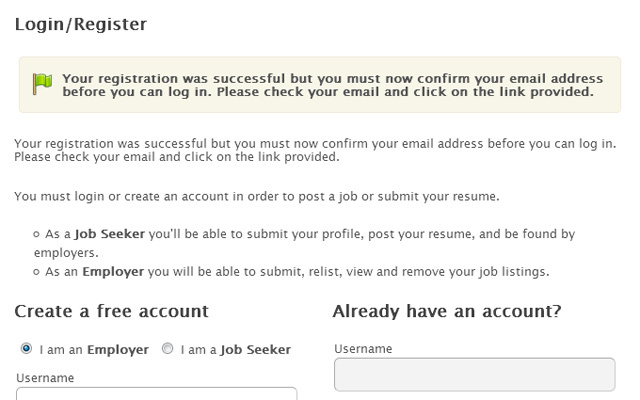 Adds an option to resend confirmation email. Admins can see not confirmed users in ‘wp-admin’ on separate list. The Confirm Email plugin will work with any theme that supports AppThemes custom login pages. 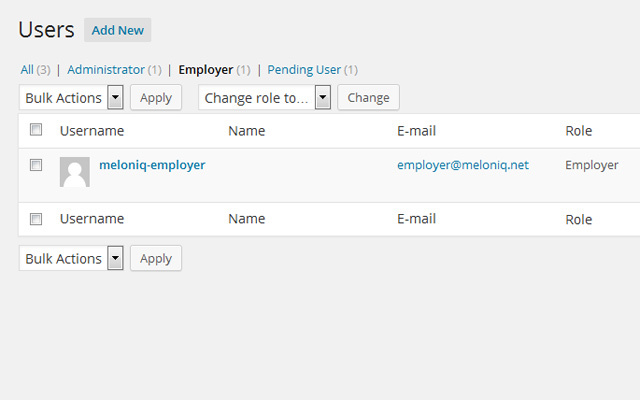 Once activated, register new user account on your site to see plugin in action. Just paid for it, installed it, activated it and registered on the site as a new user. No settings required just worked as advertised. Brilliant…THANKS!! 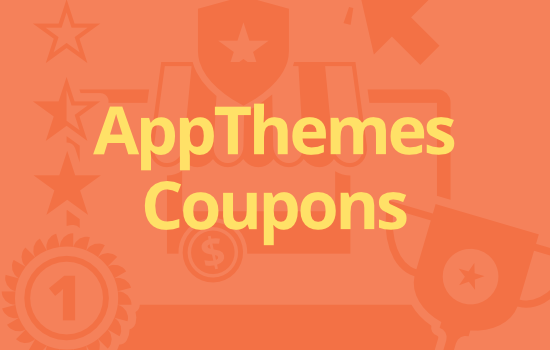 The plugin appears to have specific code related to other Appthemes themes, but not Vantage. 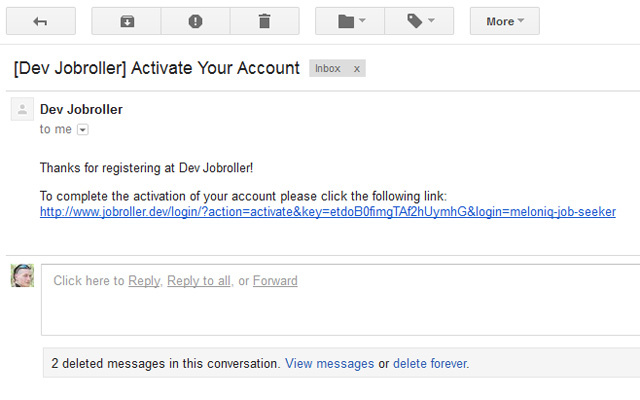 After a user registers, they receive the Activation e-mail. After they follow the link and Activate their account, they are sent a 2nd e-mail with their username and a link to reset their password, which is confusing since they just set their password. There is a work-around for other themes by modifying the plugin, but there not does not appear to be one for Vantage. A must to stop spam. I’m convinced that people having problems with this plugin haven’t installed it properly or their mail settings are upside down. This plugin is a must if you want to stop fake registered users. I have purchased this addon , install it but it doesn’t work. 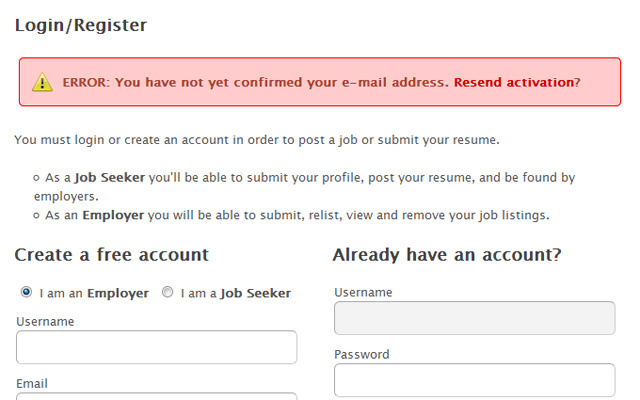 After user register it will NOT receive a confirmation email. I also found, unfortunately, after I purchase it that more people are experiencing the same problem. Looks like no complains is taking seriously here. How can I request my money back. The program works as advertized! …however, I still get junk registrations at 90% of the old rate. It would be nice to somehow have the user answer a challenge question or another means of verifying that the user isn’t a bot. This plugin simply does not work. Support does not work. I gave up a long time use. We’re working on fixes. @liquidaexpress, can you explain the problem you’re having? What theme and WordPress version are you using? If you’ve already started a forum thread, please include that link. New version 1.1 of the plugin has been released fixing issues with sending emails with credentials before the activation email, and with creating ‘Pending’ user role on Multisite when plugin was Network activated. Hello , it Seems everything is working fine but how to remove second email with the content name and the user password, that is sent two identical letters. Thank you! Issue with sending second email has been fixed in recent release, please download a fresh copy from your user dashboard ( https://my.appthemes.com/purchases/ ), and update plugin on your site. If it still sending second registration email, please open a thread on forum and provide details about you site setup: what theme and in which version, what plugins and child theme do you use. I purchased this plugin and have been using it. I am getting warnings from security software to update to version 1.1. When I use auto update it stays at the same version 1.0, I downloaded from my account at Appthemes and this version is also version 1.0. How do I get 1.1 ? What security software you are using that warns you about potential risk by downloading this plugin? To download a fresh copy visit your user dashboard: https://my.appthemes.com/purchases/ Current plugin version is 1.2, I have did a test, download of new version works from the dashboard. I also am asking… How do you get version 1.1? Current plugin version is 1.2, I have did a test, download of new version works from the dashboard. Thank you for your reply meloniq. WordFence warns me to update. 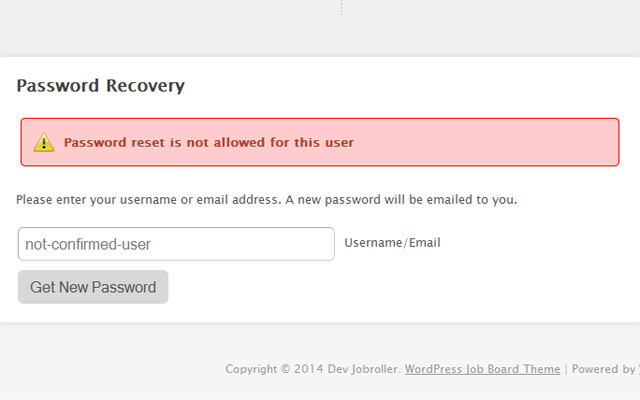 Plugin update from within WordPress downloads version 1.0. Download is 1.2 and also updates from within WordPress are now 1.2. Works like it is supposed to. Where can I find the unconfirmed user list? 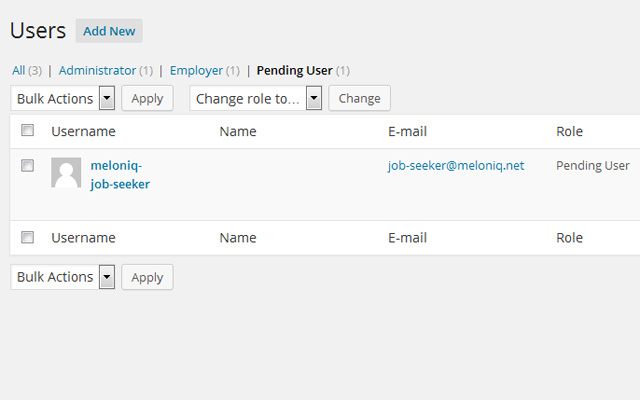 Look in your dashboard under USERS – you will find a new category has been put in place named Pending User – click on that and you will see all Pending Users. will this plugin work in classipress? and how to install ? my claasipress new user registration email going to spam folder..even im getting mail to spam folder..will that work fine after i install this plugin? Hello. Is there are way to enhance the emails sent by this plugin, for example, add logo and change font style? Currently it sends only a thank you sentence followed by complete activation link, which i prefer to style that and add logo. Hi … does this plugin work with latest version of classipress ? That plugin not send email. I have that plugin on page. how to fix it ? I use classipress 3.6.1 and classipost last version. I installed confirm email plugin but it does not send email to user. Is there something I have to setup? Just purchased the plugin, Thanks. It sends the verification link. I click on it and verify my account. This part works. BUT, it does NOT send the email with password! Even after I verify my account I still do not receive the password. How are users suppose-to log into their account later without receiving their login info and password?? The email was in the “promotions” folder in the gmail. Sometimes gmail sends mail there for whatever reason. Interesting and very informative post! Nice plugin. It is very useful. Start offering coupons and promotions to your customers.